While there is no scientific evidence objectively, nevertheless the antiperspirant effect of sage due to many years of experience to understand values​​, reports and applications. Experimental studies have shown that the extracts inhibit the sage in the form of teas or capsules, the glandular activity and so reduce the excretion of water through the skin. Sage acts antihidrotic and astringent. Probably show up for this sage of the tannins responsible. Not for nothing has the pharmaceutical industry made ​​the active ingredients of sage and placed advantage sweat reducing agents (anticholinergics) to the market. 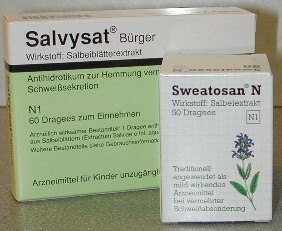 Salbei Medikamente Dragees mit SalbeiextraktAmong the most famous sage against drugs include increased perspiration and Salvysat Sweatosan ® N ® Drageeform. These are round or oval tablets, sugar coated, provided with a coating of sugar, so that the tablets disintegrate in one's stomach or bowel, and made ​​the release of the sage-targeted drug. Pure sage or sage based on drugs help to reduce hot flushes and mild to moderate forms of excessive sweating. Especially in the stages of life characterized by hormonal changes of puberty and the menopause in women may be usefully and sage-time, when it comes to typical uncontrolled sweating. The effectiveness of the sage is in two significant variables in the Sweating cycle , the temperature center in the brain as well as on the sweat glands themselves this way, the sweat production can be reduced effectively. Sage of substances also develop estrogenic effects of female hormones can balance positive, especially in the menopause.